Not a food snob, I never raise my eyebrows or gasp audibly at the use of commercial pectin. I use commercial pectin myself 99% of the time. And even after I’ve learned to make apple pectin from scratch, I still like the convenience of commercial pectin. 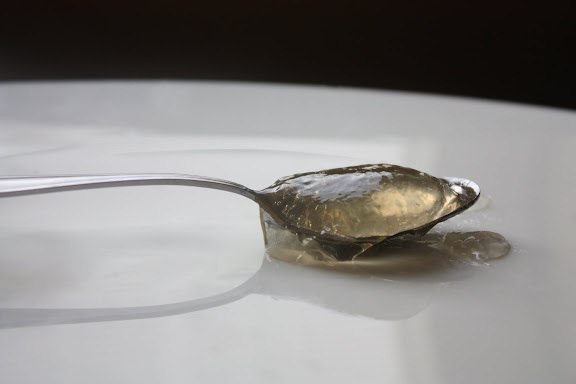 But since I’ve recently developed a habit of picking my own apples from a local orchard every fall, I thought I would experiment with Christine Ferber‘s method of making her “pectin stock jelly” — her prescribed gelling agent. With a peck of green Granny Smith apples on hand, I set out to find out what it’s like to make jam in order to make jam. For those whose lives revolve around jams and preserves, the name of Christine Ferber is probably familiar to you. For non-jammers, Christine Ferber is a daughter of 4th generation bakers who, denied professional training from Alsatian pâtissiers on the basis of her being a woman, went to Belgium to learn her craft. She went back to the Alsace and started making world-renowned jams and pastries ever since. How good is Christine Ferber? Enough to be dubbed “the Jam Fairy” (la fée des confitures) by the French and to have someone like Alain Ducasse preface her book (Mes Confitures: The Jams and Jellies of Christine Ferber has been translated, albeit somewhat awkwardly, into English for nearly a decade). 1. Cut 4 green apples into chunks — peel, cores, seeds and all. 2. Boil the heck out of them and strain the apple mass through a fine-meshed sieve. 3. Collect the juice and reduce it down to pectin consistency. However, Ferber has gone a step further; she turns apple pectin into apple jelly first, then use it as her pectin stock jelly. In other words, to make many of the jams in her book, you have to first make jam which will be used in your subsequent jams as the gelling agent. Ferber’s book talks about how to use this pectin stock apple jelly in details, but in general about 7 ounces of the apple jelly is used for each 3- 4-pounds’ worth of fruit(s). According to Ferber, for the best preservation effect, the jam should be about 65% sugar. Since fruit normally has about 10-15% sugar, the amount of cane sugar added is roughly the same as the fruit. And, no, you can’t reduce the amount of sugar willy-nilly. For sure, using natural pectin has its advantages. But to ensure effective gelling, lots of sugar is needed. With commercial pectin, you can get away with less sugar in your jams. Diabetics or those who watch their carbohydrate intake can drastically reduce the amount of sugar in a jam recipe (as long as it doesn’t negatively affect the pH level of the jam which could lead to botulism in case the jam is not refrigerated) and use pectin designed for low- or no-sugar jam recipes. With natural pectin, you don’t have that kind of liberty. But, boy, does this apple jelly taste good. 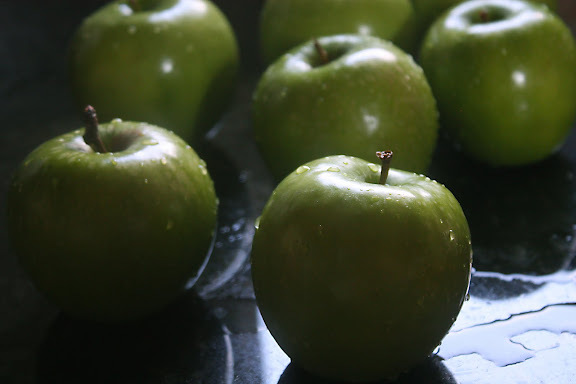 1.Clean 3.5 lbs of Granny Smith apples (the greener — in terms of ripeness — the better), remove the stems, and quarter them. Do not remove the skin, cores, or seeds. 2. 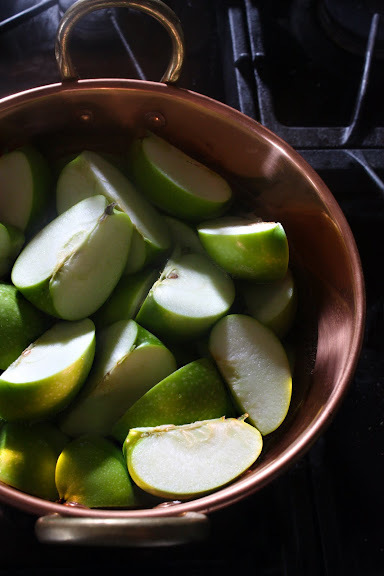 Place the apple quarters in a large saucepan with wide opening (which allows for better evaporation) and cover them with water (Ferber says to use 6.5 cups of water, but I’ve found that in order to get the required 4 1/2-cup yield, you need 8 cups of water). 3. Bring the whole thing to a boil, reduce the heat to a simmer, and let the apples cook for 30 minutes or until all of the apple pieces have disintegrated. 4. 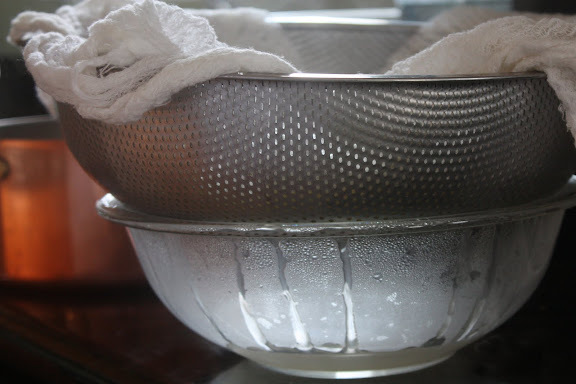 Pour the apples into a cheesecloth-lined sieve, or a mesh chinois, set over a bowl large enough to contain about 5 cups of liquid. Let the juice drip into the bowl without your help. This takes up to 2-3 hours. You need 4 1/2 cups of opaque off-white, slimy juice. 5. 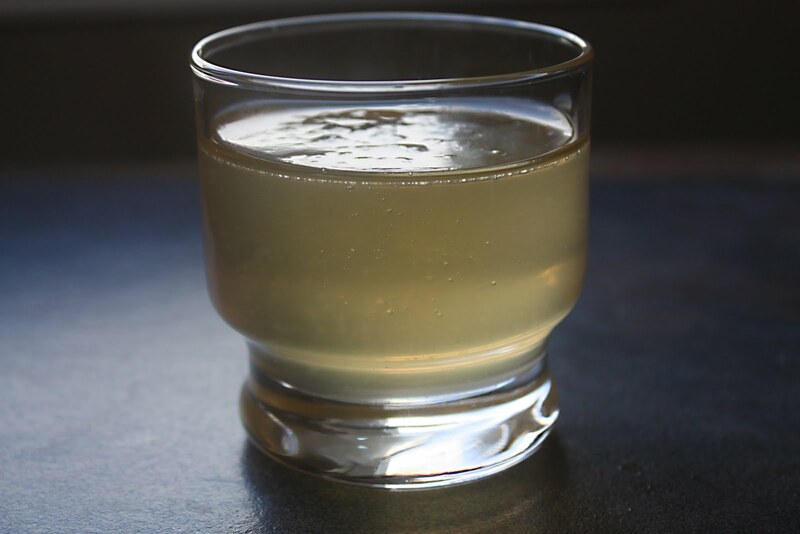 If having very, very clear apple jelly is important to you, filter the collected juice once more. I skip this step. 6. Place the collected juice in the same saucepan (which has been rinsed) along with 4 2/3 cups of sugar (2.2 lbs) and juice of one lemon; bring the mixture to a boil. 7. Quite a bit of white scum will rise to the surface; skim it off with a ladle. 8. Continue to boil and skim. Ferber says to let the mixture boil for 5-10 minutes, but the 3-4 times I make this, it took about 30-35 minutes. 9. You know the mixture is done when its temperature reaches 221° F.
10. Skim off more scum, if necessary. You should now end up with clear, yellowish, viscous liquid ready to be bottled. I keep my apple jelly in clean glass jars in the refrigerator, but to avoid refrigeration, you can process the jars in a hot water canner. 11. Depending on how much volume is lost through evaporation (which depends on the width and depth of your cooking vessel) and the skimming, you should have between 32-40 fluid ounces of apple jelly ready to be consumed as is or used in the process of begetting another jam. Slightly diluted, this jelly makes a perfect glaze for all kinds of sweet pastry as well. The only jam i’ve ever tried making is blackberry, out of sheer laziness because it was just fruit and sugar (something about the natural pectin in blaclberries). And even then, that was a jelly, not a jam. I’m going to buy apples just to make this! I must admit that looks like too much work for me, so it’s good to hear that it tastes good rather than being just an intermediate step. Fancy the Alsace patissiers only accepting men (and serves them right that they lost the opportunity to teach someone so talented). Just finished it. Thanks Leela! I am back on the etymology of “achaar” The Farsi word for it is Torsh (sour). Achaar in Farsi means tools (Aw-jar) in Hindi. So this is a no go. My next bet would be that achar is of Dravidian origin. It would account for how it traveled into Thai. I will try to track down some South Indian languages maven. Jam with jam? Interesting. I’ve yet to try making my own jam. This is very cool! I will try it! Thank you for this entry. Delicious and nice. I’m very like your website. Diana – Thank you so much for sharing your results with us. The conference pear conserve sounds really, really good. It’s almost 930 at night and I just finished the process of making this Jam be getting Jam. I bought the book about two weeks ago and have been waiting for the day that I would have enough time to make it. I have to be honest it was unlike any other process I’ve done in my rookie year of jam making. But it looks great seems to be jelling fine and it’s in the water bath now. 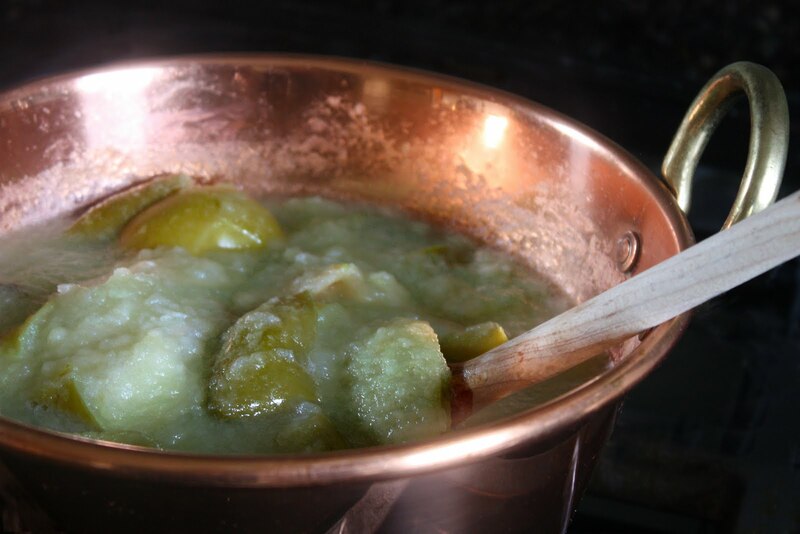 I can now hardly wait to make one of the recipes in the book using her green apple jelly.